Rwanda has finally allowed passenger buses to travel from Kigali to Kampala through the Katuna border in Kabale district and Chanika in Kisoro district but with strict restrictions against carrying Rwandans aboard. 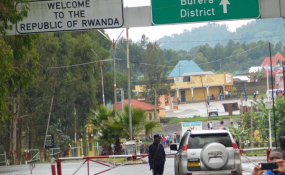 On Saturday, Rwanda Revenue Authority (RRA) increased tariffs for every truck crossing via Chanika, from Rwanda Francs 200,000 (about 816,000) to Rwanda Francs 400,000 (about Shs 1,632,000). Now, the bus operators say that they have been allowed to cross to and from Rwanda since Sunday evening but on different and tougher terms. Trinity bus company operators told our reporter that they were allowed by security and Rwanda Revenue Authority officials to cross from Rwanda to Uganda via Katuna border on Monday, on condition that they carried no Rwandans to Uganda. Gideon Ashaba, the booking officer with Jaguar Bus Company says that security and RRA officials are conducting thorough checks in all buses and those found carrying Rwandan nationals to Uganda are fined $5,000 (about Shs 18 million). Ashaba said that only 15 passengers had been cleared to travel from Kigali to Uganda by midday today. He adds that because most of their clients were Rwandan nationals, bus companies are now suffering huge losses as a result of the directive. "The situation is very very bad because from day one, buses were denied entry into Rwanda and going from Rwanda. From yesterday, we got a chance, we were told that now the buses are not free to move from Uganda to Rwanda but on condition that buses are not supposed to carry Rwandans. When they find a Rwandan passenger in our bus, the bus is fined $5000. That means now we don't have people because our customers were Rwandans. Like now, the bus has only 15 people on board out of 60. It has affected us because in terms of fuel and in terms of allowances, the buses are now operating on losses." said Ashaba. Apart from Jaguar and Trinity, other bus companies like Modern Coaster, Volcano, Mash POA and Simba are yet to resume business. The directive corresponds with a tweet by Rwandan minister of Foreign Affairs and International Cooperation, Richard Sezibera indicating that Rwandans are strongly advised not to travel to Uganda due to ongoing arrests, harassment, and torture. "The situation here in Katuna is not good, no people are crossing from Uganda to Rwanda. Rwanda is only allowing Ugandans, Congolese, Burundians to exit from Rwanda but no Rwandan is allowed to travel into Uganda. Even those who have been getting education in Uganda, they are not allowed. Those who have been getting medication from Uganda are not allowed. People who are travelling through these buses, when they are non-Rwandans there isn't any problem. But if they find that a Rwandan is in a bus, they fine you $5000." Nshangabashaija said.